A pass to Garrett Dickerson falls incomplete. The senior superback caught four passes against Wisconsin. 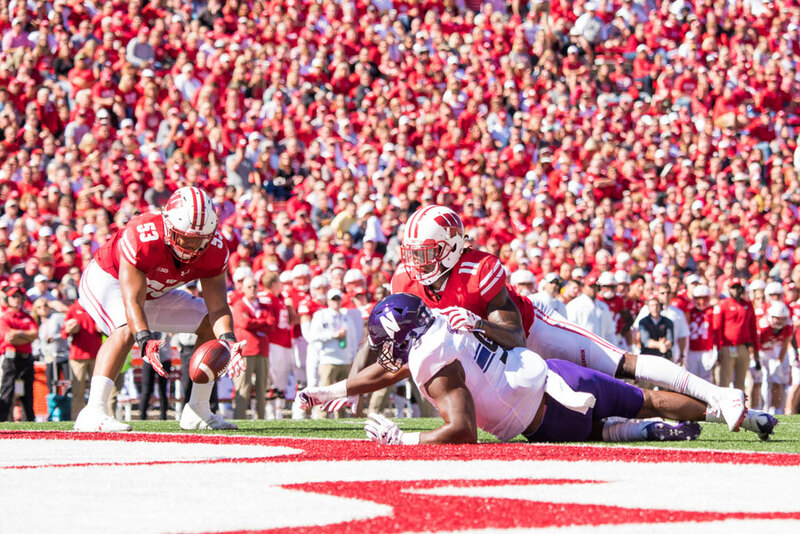 MADISON, Wis. — Northwestern appeared down and out with about 10 minutes left Saturday at No. 10 Wisconsin. Junior quarterback Clayton Thorson had just thrown a pick-six, putting the Wildcats in a 31-10 hole. But NU (2-2, 0-1 Big Ten) didn’t quit, scoring two quick touchdowns and shaving the Badgers’ (4-0, 1-0) lead to 7 points by the 2:53 mark. After forcing Wisconsin to punt, the Cats got the ball with 1:09 to go and, despite being pinned at their own 2-yard line, had the momentum on their side. Then Thorson, after evading pressure, was tackled in the end zone on the second play of the drive. The late safety — the Badgers’ eighth sack of the day — sealed NU’s 33-24 loss and left Thorson with a bitter taste in his mouth. NU certainly felt it played well enough to win a game it entered as heavy underdogs. A testy Pat Fitzgerald vented about missed opportunities and miscommunications, pointing to Badgers quarterback Alex Hornibrook’s 61-yard completion early in the third quarter as a prime example. Though Saturday started well, things unraveled after halftime. The Badgers committed three first-half turnovers and the Cats took a 10-7 lead into the break, looking to pull off an upset on national television. Just one game into conference play, NU faces an uphill battle for a Big Ten West title. To make the conference championship game, the Cats would need to surpass Wisconsin outright as the Badgers now own the tiebreaker. That task could be a challenge, with a home tilt against No. 4 Penn State looming next weekend. As NU spoke to media post-game Saturday, TV screens showed the Nittany Lions taking a 21-0 first-quarter lead over Indiana. The Cats know what they’re up against, but the big question remains: Can they put together a full 60-minute performance?